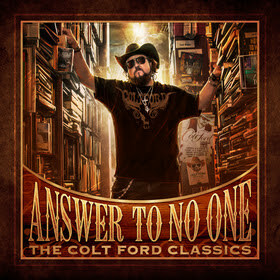 Answer To No One: The Colt Ford Classics, a superior collection of 14 real-life story songs written by a country artist who paved his own way with his unique style and sonically lead the way for many others, traces Ford’s musical evolution from 2008 through 2014. Set for release on October 23, 2015 on Average Joes Entertainment, pre-order the album here and instantly receive "Cut 'Em All" feat. Duck Dynasty's, Willie Robertson. Four of Ford’s five albums have peaked in the Top 10 on the Billboard Country chart, with Chicken & Biscuits (#8), Every Chance I Get (#3), Declaration of Independence (#1) and Thanks for Listening (#2), with the latter two hitting the Billboard 200 at #4 and #10, respectively. All his best-known hits are represented on Answer to No One, from his debut, “No Trash in My Trailer,” and his duets with Brantley Gilbert (“Dirt Road Anthem”) and Jason Aldean (“Drivin’ Around Song”) to collaborations with Jake Owen (“Back”), Duck Dynasty’s Boss Hog Willie Robertson (“Cut ‘Em All”), Eric Church (“Country Thang”), Jamey Johnson (“Cold Beer”), John Michael Montgomery (“Ride Through the Country”) and Nappy Roots and Nic Cowen (“Waste Some Time”). Fans flock to Colt Ford’s shows to experience his high-energy jam-packed concerts. Several major US Tours are planned in support of the new album in 2016. In addition, Ford continues to strike a chord with fans that relate to such common values as God, Family, Friends, America and Hard Work – a sentiment that is woven throughout the new album. Ford Answers To No One but his fans, and continues to reach new fans as evidenced by his growing social media statistics; 100 Million YouTube views; 1.5 million Facebook “Likes,” 320,000 Twitter followers.